Small, rigid type with a proven reliability and durability. Casting, materials and manufacturing strictly controlled and certified according to international standards ANSI, ISO. High efficiency over a wide operating range with excellent suction performance. Many years of proven performance and experience with a wide and diverse range of applications. Water treatment units, water purifying applications, wastewater drainage. Petrochemical, Soda, chemical fertilizer, pulp and paper. Dye work process, Dye synthetic factories and bleaching liquid treating process. Oil, Fat and Fuel Industries. Oil refining, soap, paint producing factories and fuel oil transfer. Spinning and chemical fiber factories. Drug, Cosmetics Manufacturing, medical facilities. Brewage, milk, fruit juice, vinegar and Japanese sake production, salt, sugar and beet sugar industry. Plate, steel plate, wire and coating industries. Sprinkling of agricultural chemicals, fish farming and sea water handling. c. Single Mechanical Seal and Gland packing (Oil Seal) Combination. d. Additional Special Mechanical Seal may be installed on request. Steam jackets are available for both sides of casing to prevent pumping liquid from solidifying. Possibility to change and adapt the directions of exhaust pipes upon request. a. 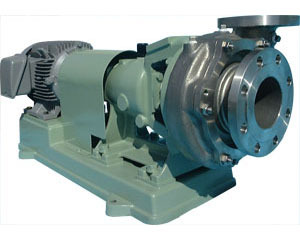 219∼1526 pump series are equipped with a semi-open impeller as standard. b. Pump series 1534, 1540, 2026 and 2034 are equipped with a closed impeller as standard. Semi-open impeller may be installed on request.